Spanish Fort rests on a hill overlooking Mobile Bay, just 10 miles east of Mobile. 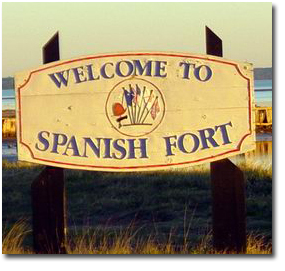 Spanish Fort, as an incorporated city, is quite young, having been established on July 19, 1993. The residents of this growing community welcomed the idea of becoming their own city with an annexation by the City of Daphne. The spirit of community remains the common bond between both residents and City officials. The local officials strive to manage growth and maintain small-town values. While the city itself is barely over two decades old, the area is rich in history. Fort Blakely (then spelled Blakeley) was the site for the last major battle of the Civil War. Shortly after the surrender of General Robert E. Lee in Virginia, the Battle of Blakeley was fought at Fort Blakeley on April 9, 1865 at 5:30 p.m. It was a major news event in the ongoing coverage of the Civil War as depicted in the scene above from “Harper’s Weekly” of May 17, 1865. “Probably the last charge of this war, it was as gallant as any on record,” Harper’s reported. Historic Blakeley State Park was created in 1981 to preserve the National Register Site and its 5 1/2 miles of pristine breastworks. The deep history is evident along the streets of Spanish Fort Estates. Many streets have names associated with the Civil War. Street names include General Canby Drive, General Gibson Drive, Bugle Retreat, Rally Road, Artillery Range, Confederate Drive, Soldier’s Route, Blakeley Way, Union Pass, and Cavalry Charge. Remnants of breastworks (Civil War fortifications) from the Civil War still remain throughout the area subdivisions. As of 2014, Spanish Fort’s population is 6,936 people. Since 2000, it has had a population growth of 30.38%. The median home cost in Spanish Fort is $219,800. Home appreciation the last year has been 5.40%. Compared to the rest of the country, Spanish Fort’s cost of living is 7.50% higher than the U.S. average. And unemployment is well below the national average. Spanish Fort features two K-5 elementary schools, a middle and high school. The public school system spends approximately $9,017 per student and maintains a 15 students per teacher ratio. In light of this growth, it is no surprise several high-end neighborhoods have sprung up in Spanish Forth. Just a short drive up Highway 225 gives you many subdivision choices. Blakely Forest subdivision sits adjacent to Spanish Fort Estates. This neighborhood is more established than some of the newer ones, but is in no way lacking the serene surroundings and beautiful homes featured in nearby communities. Homes here start in the 300’s and average 3000 sq ft.
Stillwater is just a few miles north on Highway 225. Homes range from 2100 to more than 5000 sq ft and are situated on large lots. Prices range from the high $300’s to over $500. Community amenities include a clubhouse, pool, volleyball court, tennis court and playground. The Lakes, which includes North Lake and Wilkins Creek Estates, is a wonderful community with many housing style options. With three lakes, walking trails and wooded lots, this community offers a peaceful respite to residents. You can choose from existing homes or pick a lot to build a custom home that’s perfect for your needs. Lots range from 1/3 to 1/2 acre and feature lush landscaping. Some highlights of the homes include hand-scraped hardwood floors, stainless steel appliances and granite countertops. This neighborhood is zoned for the Spanish Fort school district and is in close proximity to downtown Mobile and I-65. Cambron is a beautiful community located in Spanish Fort. It offers a very convenient location as it is only a 10 minute drive to the Eastern Shore Centre and 20 minutes from both Fairhope and Mobile. Audubon features wooded estate lots, beautiful landscaping, hills, trees, and plenty of green space. It is located near Spanish Fort High School and just minutes from I-10, shopping and dining. Home highlights include hand-scraped hardwood floors, stainless steel appliances, large master bedrooms and start in the $300’s. Rayne Plantation, located off of Highway 31 in Spanish Fort, is a brand-new community that is currently under construction. Rayne Plantation will offer luxury living will all of the amenities. This premium location offers you the feel of a secluded community with shopping, restaurants and entertainment just 10 minutes away. Now is the time to find a place in Spanish Fort to call home while home values are rising!